We are a full-service commercial roofing contractor and have been in business in the same location for more than 33 years. We are also a Golden Star Applicator of Certainteed built-up roofing systems, which is a distinction most other roofers simply don’t have. 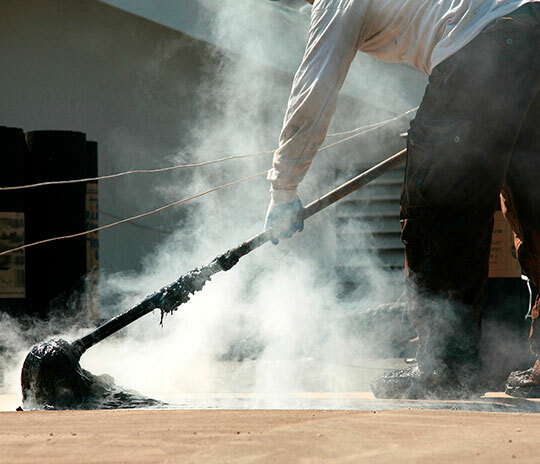 Don’t trust your built-up hot asphalt roofing project to just anyone. And never settle for less than the best. What Does Hiring Rooftoppers Mean for You? What it means is that you are hiring a reputable roofing company with a good standing in the community and we will be here for you when you need us for all your roofing repairs, replacements and warranty needs now and for years to come. Hiring an experienced roofer doesn’t mean casually selecting a random name from some list. It’s imperative that you find a roofing contractor with the knowledge and expertise needed for your particular situation. And one who is properly licensed and insured in the State of California. If you don’t, and you end up having to file an insurance claim, your homeowner’s insurance might not cover the damage because you used an unlicensed contractor. This is just one example of how not knowing something can land you in a whole heap of trouble, as well as having to pay for a major unplanned expense! Don’t let this be you. A built-up roof, also commonly referred to using the acronym BUR, is a roof that’s made with built-up layers of tar and gravel. This type of roofing system is composed of alternating layers of bitumen and reinforcing fabrics that are formed to make a roofing membrane. Their fabrics are also known as felts or ply sheets and are reinforced with glass-fiber mats or organic mats. Then after each fabric layer has been added, a finishing layer of aggregate is applied as a top coating. Built-up roofing is most commonly used on low-slope roofs such as commercial, industrial and institutional buildings. There are several different types of built-up roofing applications that can be used. Here is a general overview of each.